BAKU, Azerbaijan -- Marcus Browne is one win away from competing in the 2012 Summer Olympics in London after Team USA's light heavyweight entrant improved to 2-0 at the AIBA World Boxing Championships Sunday with a 10-6 three-round decision over Georgia's Levan Guledani. 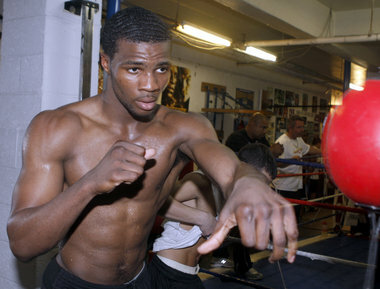 Hilton Flores/Staten Island Advance File PhotoClifton resident Marcus Browne is one win away from locking up a berth competing in the 2012 Summer Olympics in London after winning his second straight fight at the AIBA World Boxing Championships in Azerbaijan. The 20-year-old Clifton resident will now face Egor Mekhontsev of Russia Tuesday night Baku time (on Staten Island, the bout will take place Wednesday morning). Should Browne win, he would guaranteed of finishing in the top 10 of the light heavyweight division and with it an automatic berth to compete in London. Should he lose, he would still qualify should Mekhontsev -- the 2009 world heavyweight champion in the amateur ranks -- go on to finish in the top two of the division in the single-elimination tournament. Browne -- coming off a first-punch, 15-second knockout of Japan's Yoshitsuna Okada earlier in the week -- got off to a slow start against Guledani, who outpointed Browne 4-3 after the first three minutes. But the three-time Golden Gloves champion rallied in the second round to take an 8-5 advantage. The 6-foot-2 southpaw then held Guledani at bay in the third round to finish up with the 10-6 victory. "The fight was pretty much one sided, but after the first round they had him up when he clearly didn't land anything," Browne told the Advance. "So it was 3-4 him. Then in the second, I stepped it up and grabbed the lead, 8-5. And in the third, I picked it up and started boxing." Browne, the 2010 Police Athletic League national champion, fights out of the Atlas Cops 'N Kids Boxing Club located in the Park Hill apartments in Clifton.